God is love and He is close to us and teaches us how to speak the language of love. St Paul wrote, “The Lord is near” and this expression has a deliberate double meaning. First, the Lord is near in time and we should expect him at any moment. There is always great excitement when a famous person is expected to arrive, the crowds gather in anticipation when a star is due to appear. What great excitement there is at the thought that Jesus is about to come and we will see Him. God is near in the Blessed Sacrament and he comes to us each day during the Holy Mass. Secondly, the Lord is near in the sense that He is already present in this world, in the sacraments and present in His spirit. He is present in the Eucharist in the tabernacle and in each priest’s hands. A priest is a living sacrament, the hands of a priest are anointed by the Lord. God being present in spirit, it means that we may sense His presence. We hear His voice in our hearts, we speak to Him and although we cannot see the Risen Jesus we abide in His presence. He said, “I will be with you now and forever.” Jesus is indeed very near to us today, tomorrow and every day. He does not come alone but together with many saints who are close to the Lord. We can rely on the intercession of St Faustina, St John Paul II, St Padre Pio, Blessed Father Michael Sopocko and many, many other saints. The Lord is near. When we are close to the Lord, He is close to us when we are searching for Him, He will answer our desires. He will fill our hearts with a divine and merciful presence. I assure you of the constant prayer of the priests of the Congregation of St Michael the Archangel for all our readers and their families. 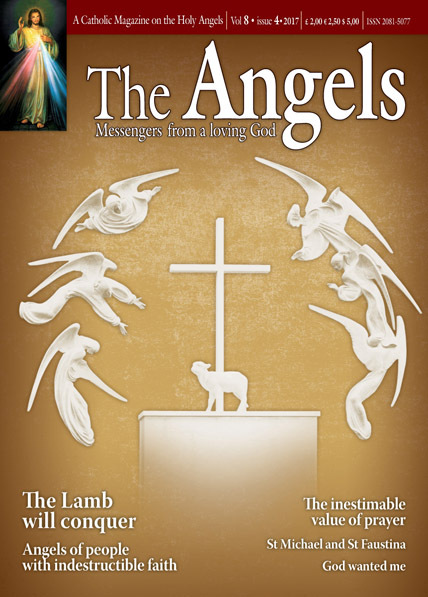 Kindly let others know about this magazine and also our new Q&A booklet that answers many questions on the holy angels and St Michael. We have a wealth of information including prayers, forthcoming missions and pilgrimages, the Knighthood of St Michael, back issues of the magazine and much more on our English CSMA website. Ask your family and friends to view it www.stmichaelthearchangel.info.